Small-sided games have been a part of our soccer history in the United States for generations and continues to develop world-class players around the globe. In the past it was not uncommon for small-sided games to be played in the streets and in vacant lots with uneven numbers and mixed ages. Now our streets are too busy and the vacant lot we used to play on no longer exists. Thus, it has become the responsibility of soccer coaches to recreate the small-sided environment in their practices. The “Small-Sided” environment, if properly adjusted, can improve players technically and tactically within a short period of time. It is a realistic FUN playing environment that can result in rapid player development. And much/much more to add variety to your practices and disguise the hard work it takes to get to the next level. 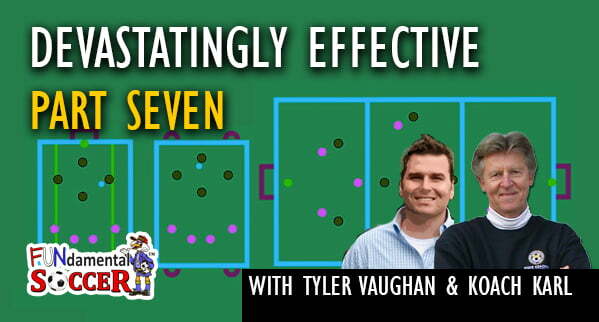 Listen to this enlightening segment as Tyler Vaughan and Koach Karl deliver Step #6 of the very comprehensive FUNdamental SOCCER “9 Step Practice Routine” with context and relevance that can be applied to any skill level and age. No matter whether you are a beginning, intermediate or advanced coach. No matter whether you are dealing with beginning, intermediate or advanced players. This podcast will challenge your current thinking/understanding of small-sided games and encourage you to consider a simpler less complicated approach … That Really Works & Is lots of FUN! Now, sit-back relax and join us with an open-mind and note taking materials! Subscribe to Between The Posts and listen to this episode (Ep. 22), kindly give it a review, and share the episode with other coaches who could benefit! We appreciate YOUR support! Between The Posts is a podcast powered by revolutionary goalkeeper glove brand Renegade GK.